Batman is a character who lends himself to bold artistic interpretations. Over the 70 odd years since his creation many of the brightest and best talents have put their stamp on the Dark Knight, and often to electrifying effect. There’s something bold and simple about the character’s design that lends itself to graphical innovation, and the neo-gothic ultra noir of Gotham provide the perfect artistic backdrop. As such there’s an embarrassment of riches to choose from with regards to spectacular cover runs, and truth be told I feel a little guilty about selecting any Bat-comics for exposure in this series simply because of their sheer ubiquity – the aim of this feature is generally to expose work that may have been forgotten or overlooked. There is however one short run of Bat-covers that I have always adored, and that I just had to showcase for anyone who hasn’t seen them before. Simply put, these are some of my very favourite comic covers ever; strong stylish and vibrant they showcase the visceral power of the medium at it’s best. 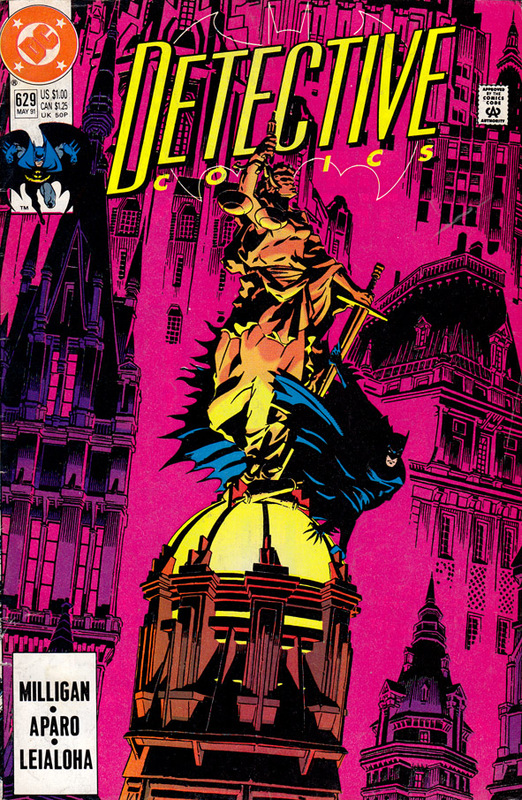 The covers ran mostly during Peter Milligan’s brief but very enjoyable run on the title in the very early 90′s. Milligan is a hit and miss writer when working on corporate properties, but this underrated sequence of stories are by and large fantastic and well worth seeking out. The writer plays up the detective aspects of the character in a series of done-in-ones that nonetheless have a nice dose of supernatural weirdness running through them, not to mention his trademark surrealistic flourishes. Jim Aparo’s artwork gives just the right 1970′s flavour to set the tone of the stories perfectly. It’s the covers though that really shine. Whenever I periodically cull my comics, there’s never a question that these few comics will make the transition into whatever phase my collection takes. I bought these comics from local newsagents, when American comics would arrive in irregular bundles, with seemingly little rhyme or reason to their selection. At the time I found a lot of these comics to be fairly insipid looking, but bought whatever I could find to feed my burgeoning habit. That’s perhaps why I love this run so much – these are stylish covers that pop with life – heavy noir stylings matched with a beautifully garish, yet restrained palette, and they shone like a a beacon amongst the pedestrian competition. You can feel the hot neon glow of this Gotham, with it’s inky protector haunting each crevice and corner. Golden’s Batman is a strong graphical presence in these images – his cowl and cape snap with leathery solidity. This is Neal Adam’s Batman rather than Frank Miller’s, refined , hardened and stylised. 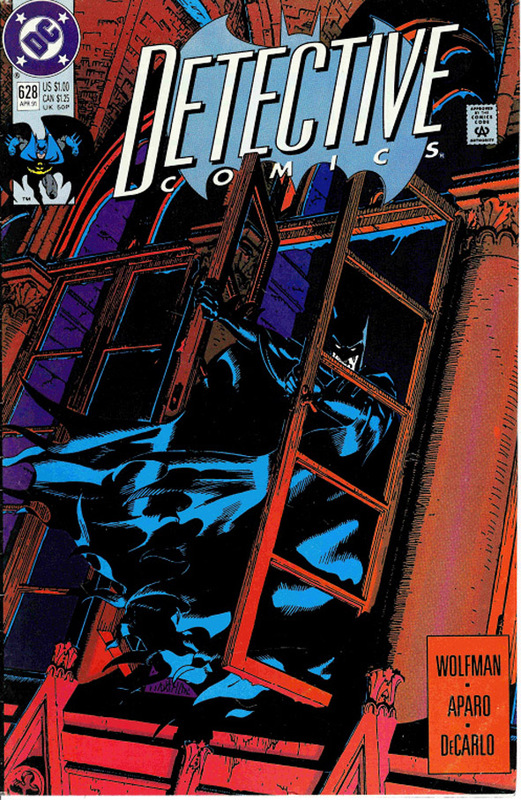 Golden’s use of shadows is enviably bold, from the folds of Batman’s cape, the arch of the window and the room he’s emerging from. I also love the angle – how many startled denizens of Gotham have glanced up to see this sight, as the police sirens howl in the night? 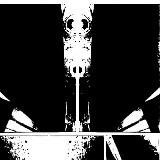 How many times has this been the last thing a thug sees before a Batarang cracks into their temple? This is a classy, beautifully composed image from a confident artist, packed with illustrative flourishes but pure and pulpy nonetheless. I love the fact that the colourist (be it Golden himself or a sympathetic collaborator) chooses one dominant hue per cover – the bold green chosen for this interior image is surprising and all the better for it. 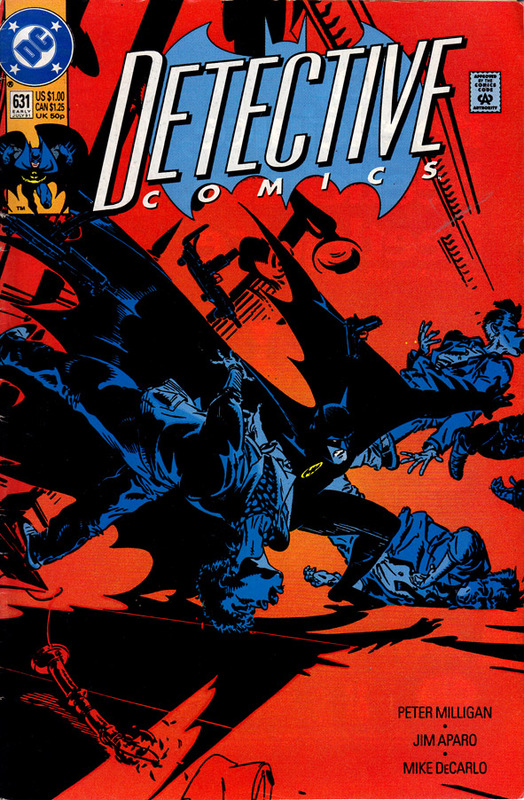 It serves to disorientate the reader, which is only enhanced by the figure of Batman plummeting purposefully to the ground. Is he falling? Or pile-driving down towards an unsuspecting stooge? The terrified building dweller caught in the shadows is another sublime touch. This is just a great kinetic action shot. The elastic contortions of the hoodlums as Batman steams into them and the fractured chiaroscuro of the background give a fantastic sense of crunching impact. This is the frenzied cartoon brawling of the 60′s TV show given a beautifully stark Dark Age update. So if you’re going to do a ‘Batman-with-gargoyle’ shot, then you’d best do it right. 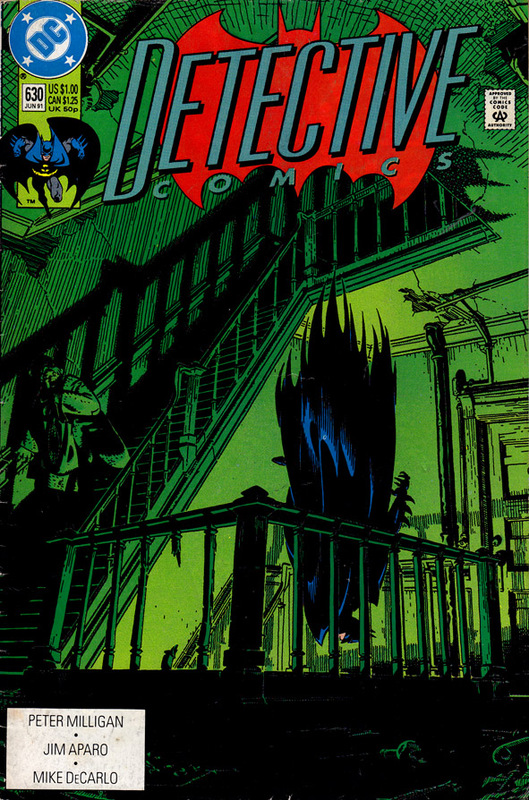 I should also mention here that I love this iteration of the Detective Comics logo – it’s pulpy, stylish, sleek and suits perfectly the art deco flavour of the covers. 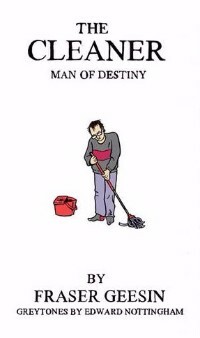 Another thing I love about these covers is that they don’t actually reflect the stories in the comics. Now arguably this can be problematic, but for me they simply say: you want to read this comic, regardless. Any comics that look this good has my attention, and at the end of the day that’s what you need. Perfect, beautiful pop art hidden away on a cheaply printed comic shoved on the bottom shelf of a newsagents, waiting for a comics-hungry kid to find them. 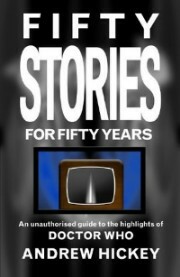 Read the previous Cover Versions post here. Beautiful stuff, thanks for this post. The green cover might be one of my favorite Batman covers ever. Also, the entire color scheme in #629 just reminds me that I want to see bolder coloring choices in new comics. 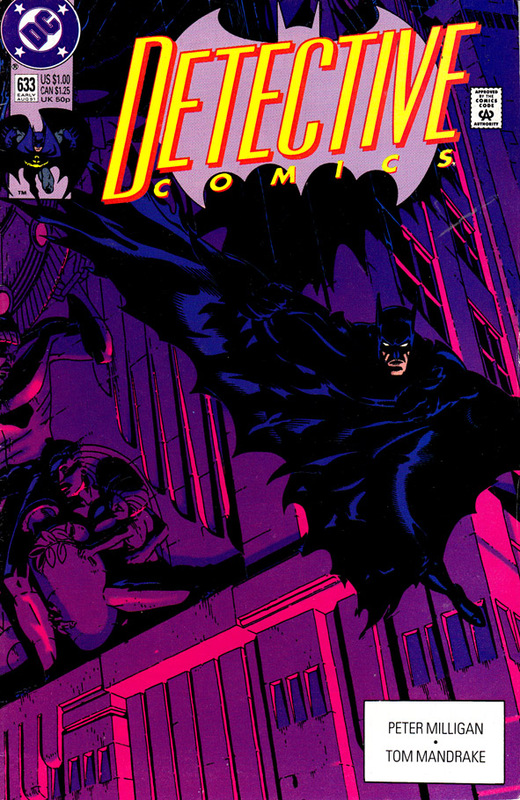 I like that there’s always been a precedent in the batmanverse for Morrison’s Neon Knight. Grabbed up all of these and a few more from a similar vintage while trying to bring together my Milligan, Wagner, Grant, BREYFOGLE era. Really liked the one from “The Bomb” issue as well. Very choice and one of my favorite (if short) little runs in Batman. Love these issues, love these covers. Golden’s cover for issue 626 was magnificent too. George Pratt also drew great covers around this time, although three of them were sadly accompanied by a godawful Louise Simonson story arc. A great era for Batman overall, though. One of my favorite cover runs, as well. 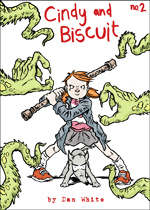 I was loving that Milligan run, anyway, and the Golden covers were very much icing on the cake. That piece for issue 630 is one of my favorite Batman images ever: unconventional, but also perfect. I love it when artists find interesting ways to move these acrobatic characters through the nooks and crannies of the urban environment.